Landlocked and almost completely surrounded by South Africa, the small country of Swaziland is Africa’s last remaining monarchy. Geographically comparable to the size of New Jersey, Swaziland’s population is roughly 1,436,000 people. Recently surpassing Botswana with the world’s highest HIV/AIDS infection rate, HIV/AIDS related deaths have overall lowered life expectancy, increased infant mortality rates, increased the country’s death rate, and lowered the population growth rate. There is no question that the increasing rate of HIV/AIDS has affected economic growth in the country. An unfortunate consequence of the stigma of HIV/AIDS is the number of children disregarded because of their association with the disease. The population of HIV/AIDS affected orphans and vulnerable children, an estimated 15,000 from child headed households, face intense challenges that affect their survival. Currently, SOHO is developing programs in three areas of Swaziland: Mhlosheni, HhoHho, and Nhlambeni. The organization addresses needs of orphans and vulnerable children throughout the country. n atmosphere that is happy and promising, as children who at one time cried from their loneliness and hunger pains are now nurtured and fed. The children are excited to see new faces, and eager to sing and play with new friends. Services and programs at The Welcome Place address various needs. 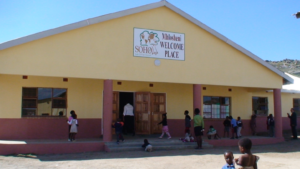 In January 2013, SOHO opened The Welcome Place in Nhlambeni , serving a group of over 33 children and growing. To see photos of The Welcome Place in Nhlambeni, click here! A Feeding Program: Serving roughly 95 children, the program feeds children attending school, as well as children in the area in need of food. Basic Health Care: Volunteer health professionals treat infections, and cases such as scabies, and tinea. Once or twice a year, The Welcome Place is a Free Health Clinic site for organized groups of students and health professionals. Moreover, SOHO’s volunteer nurse treats and examines children when called to. Though The Welcome Place at Mhlosheni and Nhlambeni provide a variety of services that help orphans and vulnerable children in the area, much more can be done at these sites. Monetary contributions and in-kind services can help develop additional programs for children at The Welcome Place. As a result, more children can be fed, clothed, educated, and nurtured through your contributions. Help SOHO’s programs develop and grow, and donate today! Green mountainous landscapes and the sound of water from nearby streams contribute to the beauty of HhoHho, Swaziland. SOHO’s agricultural land in the HhoHho region is situated near Pigg’s Peak, an attraction for many tourists visiting the area. In the midst of the picturesque environment, the land helps provide employment for women in the community, and some food for SOHO’s feeding programs. 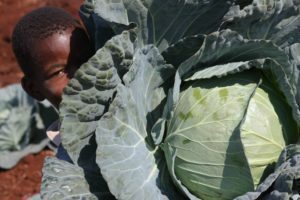 Visitors and volunteers are awed by the size of the vegetables grown in HhoHho, as only two or three heads of cabbage can fit in back of a large car trunk. In a country where many children eat one unbalanced meal a day, availability of fresh vegetables contributes greatly to the health of children SOHO serves. To help SOHO’s Community Garden Projects grow, donate today!